To get the Stone Hatchet in Red Dead Redemption 2 you’ll have to be a regular GTA Online player. Much like the treasure hunt which unlocks the Double-Action Revolver for use in GTA Online and Red Dead Redemption 2, the Stone Hatchet is only available by playing GTA Online. The bounty is live in GTA Online, and here’s how you can earn the Stone Hatchet for yourself. While playing GTA Online, a text message asking you to complete a bounty will come from Maude Eccles, Trevor’s bail bonds contact from GTA 5. Maude wants you to bring 5 bounties back in total, and in return gives you coordinates for the Stone Hatchet. Once you have the Stone Hatchet, you’ll need to get 25 kills while using it. Once 25 enemies have been butchered, you’ll unlock a GTA $250,000 reward and the Stone Hatchet will become available as an exclusive weapon in Red Dead Redemption 2. To get the Stone Hatchet in Red Dead Redemption 2, you need to head north of Owanjila where you’ll find it at the Native American Burial site. 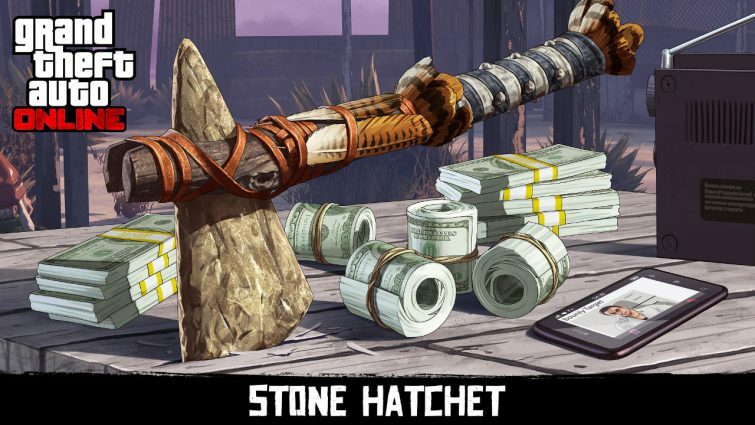 The Stone Hatchet also comes with the Rampage ability in GTA Online. It reduces damage to the player and speeds up health regeneration. Players can keep the Rampage ability going by chaining kills. You can watch the video of the bounty hunt below, courtesy of TGFGuru, TheMagixian and tehGramz. You can also find our Red Dead Online beta guide here, with tips and tricks to get you started in the single-player story missions and multiplayer modes, character customisation and more. The post Red Dead Redemption 2: how to unlock the Stone Hatchet and where to find it appeared first on VG247.